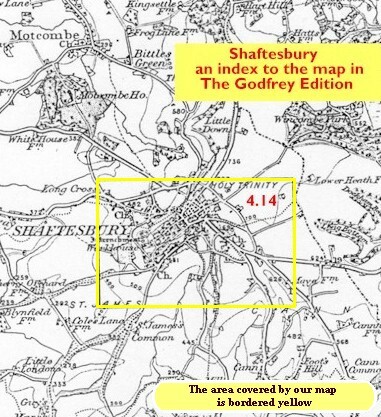 This detailed map covers the hill-top town of Shaftesbury. Features include the town centre, Holy Trinity church, High Street, St James, Butts Knap, Hawksdean Lane, St Rumbold's church, workhouse, Breach Common, Alcester, Castle Hill, Gold Hill, Park Walk, Payne's Place. Also Bimport, which features in Thomas Hardy's Jude the Obscure, where Shaftesbury is referred to as Shaston. On the north side of town the map covers Enmore Green and Long Cross. Follow this link for a complete list of our Dorset Series maps. Maps in the Godfrey Edition are taken from the 25 inch to the mile map and reduced to about 15 inches to the mile. For a full list of maps for the South West, return to the South West page.